For those not making the connection, by "twister spindial" i mean the Twister game piece that someone, who got talked into being the "referee" or someother ploy, would flick a loose pointer on, & it would land on "yellow : inner-elbow" or some other color : body-part correlation that people would try to make happen without falling down, cause that meant that they'd have to stop straddling that vixen on "turquiose : eye-lash". So, use that piece as an analog clock-face. The hip would take it literally, putting their pinky on some pink cotton-candy or their tounge against your yellow-teeth; & the lame would do the same thing except not think of a witticism such as "hyperspace time passage" or "my perception of color just altered" or "im redefining 'my pinky' as 'your navel'", that would allow a smooth transition into momentarily non-idiosyncratic conversation. Ah, the dreaded "tounge" strikes again. Could you try that again, please, but this time in English? That's harsh. Hmm, "harsh" that's a weird word. So, good doctor, am i to understand that "tounge" is too divergent from your unstated spelling for you to know what i mean? o good god; why do i even bite into bickerish bait. mysterious -1s have suddenly appeared on all my ideas... hhuh boy. One might say that this would be your loss. Obviously, proper spelling and punctuation is preferable. It bugs the hell out of me. But it's not a crime, and none of us are exempt from the occasional slip. On top of that, many of us have language and spelling difficulties (dyslexia, dyspraxia, etc). Chill. Shirley analog is an accepted spelling also. Yeah, what's with all the u's the English go in for? 'Honour.' No that's plain wrong. HONOR! Clean, perfect, symmetrical! kind of. I don't even want to get into ARSE. I don't think any-one wishes to get into your arse. Being inside your head is torment enough. The game is liable to take awhile to finish. I'm sure I'll have eyelash cramps by the end. At least you're in the game. I have absolutely no idea what this guy's on about. He's talking about using the face and spinning pointer from the game Twister as a clock. Sheesh, snarfy, you appear to be right. I wonder what this says about you that you were able to understand what he was talking about? So, depending on what this "clock" tells us about the time and where its hands point, we're just supposed to stop what we're doing and put our specified appendages on something of the color indicated? Workday a bore? Need a conversation-starter? Kids need something to do? Sounds like you need: The Twister Spindial Clock (or rename it the Twister Time Fun Clock)!! Simply take an ordinary spindial from the classic game Twister and turn it into an analog clock face, complete with time-keeping device and hands. Use the Twister Time Fun Clock as an ordinary wall clock. Whenever you find yourself begging for a little fun, take a gander at the time and do what it says! Left hand on blue? Quick - find something blue, like your girlfriend's sweater, and put your left hand on it. Right foot on green? Find something green, like a salad, and get that right foot on it! 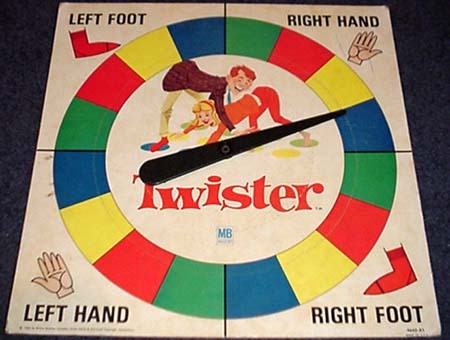 As with the original Twister game, entertainment value increases greatly with more people participating. A great party-starter. Or maybe you just wait for the clock to run down to determine where you put your hands/feet? i guess my implications were too deep & far-reaching. that's actually a fairly kindly-phrased & poignant response, XSarenkaX. I think you've just become my "person who i mumble indecipherable gibberish into their ear & they enunciate a managable plan clearly into the microphone." No quitters. first order of business: "bat-sonar... tie their shoelaces together... really long eye-lashes... deep unholy vibrato... 2 for 1... ... ...That's It." When you ask them for the time and they respond by putting their right foot on something yellow.